Hitsuji Bungaku means 'sheep literature' or 'two words we picked randomly out of the dictionary.' Originally a 5-pc all-girl high school band that covered songs by Chatmonchy, GO!GO!7188 and Sambomaster, they began writing their own songs and performing locally around Tokyo. In 2013, as high school seniors they were finalists in the Yokohama Highschool Music Festival. To concentrate on studying for university entrance exams the band went on hiatus but reunited as a 3-pc and began playing shows again in March 2015. Earlier this year, Regal Lily took part in NMFT8 and many people believe they are destined to become one of the best Japanese female bands... potentially ever. However, if there's a new band that welcomes the challenge of surpassing Regal Lily it's Hitsuji Bungaku. In fact, Fukuda, who used to drum for Regal Lily in support became Hitsuji Bungaku's official drummer in November 2015. Hitsuji Bungaku are also under the same prestigious management as Kinoko Teikoku and at just 19 years of age were invited to perform at Fuji Rock Festival this year. It's not difficult to see why many feel Hitsuji Bungaku are destined for greatness. Their music shares the same soulfulness, dark lyrical content, emotional power and sonic intensity as Regal Lily and Kinoko Teikoku's earliest material. Performing live, Fukuda attacks the drums as if he has a personal vendetta, Waako is a stalwart on bass and Heidi's sublime vocals stab beautifully at your heart conveying every single emotion directly to your soul as her guitar roars with blissful ear-shattering distortion. 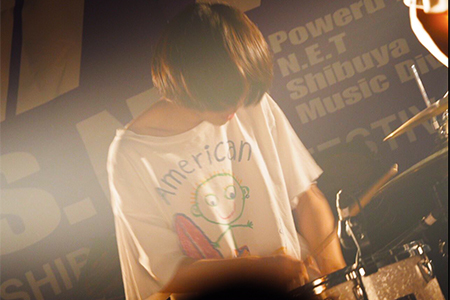 Hitsuji Bungaku are a near perfect band for fans of powerful emo/shoegaze and female-led bands such as Kinoko Teikoku, Regal Lily, Akai Koen and tricot. Being nineteen years young they have been improving their songwriting and chops at an exponential rate and clearly have a bright future ahead of them.